It should be no secret that fast growing internal audit and consulting firm SekelaXabiso is growing in confidence by the day and is ready to offer its services already much praised in the public sector to the country's big corporates as well. CFO's MD Director Graham Fehrsen visited CEO Lindani Dhlamini and found a leader full of commitment for South African Inc, with ambitions to play a bigger role than ever before in business transformation. This is Graham's writeup of a frank conversation about people management, race and changing the status quo. "Of course it is convenient for us to be a black owned firm. We have benefited tremendously from the opportunities that legislation has provided. 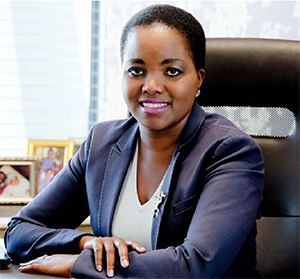 We are proud of our accomplishments, but it isn't enough," says SekelaXabiso CEO, Lindani Dhlamini as she confidently wades into the often murky waters of race and business in South Africa. "We have a longterm vision to be truly South African and we believe this will be accomplished by lifting up the people around us. While Lindani happily admits that her firm has benefited from being black owned when landing big jobs in the public sector, like the Transnet internal audit mandate, the other side of the same coin is that it remains hard to penetrate the corporate world, still largely dominated by networks of white South Africans. "We have a longterm vision to be truly South African and we believe this will be accomplished by lifting up the people around us." " Lindani's path to the top of one of South Afri-ca's leading internal audit and consulting firms began with an education in computer science and then, following an inspirational mentor, further studies to become a CA. At that time she was only the second black female chartered accountant in the country. "I should have studied IR," she jokes when asked about her journey to become CEO of the new firm, after the 2012 merger between Sekela Consulting and Xabiso Chartered Accountants. "People hold the key to our future as a company and I am very aware that, if we can tap into the potential of our people, we will become even more successful," she notes. If there is any doubt that she means what she says, a look at the fii in's multiple corporate social investment strategies provides ample proof that Lindani is concerned with actions, not just words when it comes to developing human capital. SekelaXabiso offers a bursary programme and has a chairman's fund for those within the organisation needing financial assistance to take the next step in their lives. They also offer training schemes, both externally and internally, and believe that their early engagement approach working with learners from as early as Grade 10 Oyes young people the best possible support network not only to succeed but to excel in the business world. And what of her personal efforts to lift people up? "It is easy to get caught up in the rands and cents of everyday business, so I work hard to be present as a leader by taking everyday actions that put people first. I attend internal meetings as a participant where my presence as the CEO isn't necessary, but it makes a difference to show how approachable I am and it helps me understand the people in our business. We also launched a 'shadow the leader' programme that gives staff a day with me to learn how I go about my business and to see that I am a not trial person at work, just like them." We know business is done on the back of relationships, often long standing networks of social capital, which reinforce the status quo. The challenge is to extend that network for the greater good"
Is this a reason for private sector companies to offer SKX an opportunity? ''Yes, if you buy into this notion of South Africa Inc, of course it should be! But not out of pity or a sense of charity. "We know business is done on the back of relationships, often long standing networks of social capital, which reinforce the status quo. The challenge is to extend that network for the greater good." While SekelaXabiso carves out a niche for itself and grows in confidence as a company, Lindani wants to be clear that she isn't the only leader in the firm. It's a moot point, though, as it's evident that the business is flourishing because people are empowered to become leaders themselves, on the back of Lindani's example. Looking well beyond the confines of their business alone, Seke-laXabiso is a glimpse of the future of business in South Africa. No doubt, Lindani has a major role to play.